This massive supplement clocks in at 200 pages, 1 page front cover, 1 page inside of front cover, 1 page editorial, 1 page ToC, leaving us with a massive 196 pages of content, so let’s take a look! This review was moved up in my reviewing queue as a prioritized review at the request of my patreons. I had access to the pre-release version to get this done so soon, but the review itself is based on the commercially-available version. Now, first things first: Since this is a massive book with a ridiculous amount of content inside, I cannot provide my step-by-step analysis for every single piece of crunch, as that would bloat the review beyond any actual usefulness. As such, I am going to paint with somewhat broad strokes. All right, got that? Great! We begin with a brief explanation of the Faerûnian calendar of Harptos, noting months and common names used as well as earth equivalents. General holidays like equinoxes, solstices or Greengrass are noted – Realms lore-enthusiasts should enjoy this brief recap. This, in a way, is a great indicator of the approach of the book. 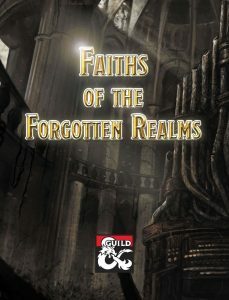 A genuine enthusiasm for the Forgotten Realms completely suffuses this book: We begin with something I consider absolutely fun – the first chapter, deeper faith, provides a metric ton of faiths, ranging from Akadi to Bane, Bhaal and Cyric, the old version of Corellon Larenthian, up to Waukeen and e.g. Valkur. Public events and holy days are noted and every single deity gets 4 suggested background story events for PCs to integrate into their game. This chapter, over 20 pages long, thus, adds imho much-needed depth regarding a vast pantheon. After this, we dive into the beating heart of this supplement: Archetypes of the faith. The colossal next chapter covers more than 160 pages and includes a METRIC TON of diverse class options to be employed by the respective characters believing in the deities. This, in short, translates to a cleric domain and a paladin oath provided for the respective followers of the deity. These are not simply soulless mechanics, mind, you, but feature edicts and prohibitions, adding narrative components to these options. There are a couple of options for other classes here as well, with e.g Talos offering access to the Circle of Storms for his druids, while Kossuth offers the Firewalker ranger archetype. As a whole, though, only clerics and paladins will get their true due here – rangers and druids or non-divine characters are pretty much left in the cold. This can be a bug or a feature, depending on your perspective – but personally, I’d have enjoyed rogue options for worshipers of Bhaal or Cyric, Gondian mage-tinkers…you get the idea. Much like the Midgard Heroes’ Handbook, this thus further cements clerics and palas as some of the best-supported 5e-classes, though here, e.g. a Deneir wizard-option, for example, would have made A LOT of sense. Neither do we get a Spellfire warlock for Mystra…oh well.. It should be noted that this book makes use of the Elemental Evil Player’s Guide and Xanathar’s Guide to Everything in its references and rules-components. The rules language employed by these, on a formal level, is remarkably good and precise. I mean it. Almost all, though not all, deities featured herein get their own array of sample spells, further adding a huge amount of mechanical content to this massive tome. Impressive here: The formatting is pretty damn meticulous and gets italicizations, bolding of material, etc. consistently right. Similarly, balancing of the components, for the most part, is impressive in its precision. The damage values and types correspond in meaningful ways with the established values – so yeah, execution-wise, this is pretty impressive as well. That being said, I know that quite a few of my readers gravitate to dynamic character options and, this is where one could complain on a high level: The designs employed here, generally, play it very safe. If you’re expecting for example complexity à la maneuver dice-systems or the feeling of radically distinct playing experiences provided by e.g. the best of the Deep magic-pdfs by Kobold Press, then you won’t find that here. We get well-executed and flavorful domains and oaths in the traditional sense, set apart mostly be the lore and tenets provided and the abilities granted. In essence, the respective engines don’t change radically from deity to deity. Shar, for example, does not get a unique form of spellcasting of the like. This, once more, is not a detriment per se, but it is something important: Some folks out there will love the decision to focus on simpler designs, and some will be disappointed. Personally, I’m, no surprise there, in the latter category, but I do absolutely appreciate the impressive craftsmanship displayed here. Now, the book does contain more than a metric ton of options for divine characters: We get information of the holy scriptures of the deities, and these brief entries ooze the wonder I expected to see: To give you an example: “Not a conventional book, the Glarathra is a large bronze flower with eight petals surrounding a spiral-shaped inner section of leaves bound together. It is a widely recognized symbol of the faith. When immersed in holy water and ‘planted’ in any depth of earth within a circle of seeds, the flower fully opens. This reveals the actual text, which is finely etched on the inner leaves.” Come on, how cool is that? Yes, this section makes perfect use of the vast canon of lore the Realms have established over the years, showing a deep understanding of what makes the respective themes work. This also can be said of the magic items presented, which include the claws of Malar or the ring of Myrkul. The chapter also introduces the “overwhelming” artifact property, which represents artifacts that are simply not made to be wielded by mortals – loved that. In case you were wondering: The actual Claw of Malar, as opposed to the ritualistic hunting weaponry, is btw. also included here. Each artifact comes with properties and curse, and from Cyrinshad to Dawnstone, I found myself fondly reminiscing about campaigns of yore and books devoured. Oh, and usability is also retained – the book comes with a multi-page index. It should also be noted that, as per the writing of this review, the book has a (VERY brief) errata file. Now, my practice as a reviewer is to never take these into account, since I’ve seen publishers point to obscure forum posts or FAQs one too many times to justify a lack of product-updates; only improvements actually implemented in the book count for the purpose of my review. That being said, I did a bit of research, and this book *IS*, at least so far, supported rather well – previous glitches brought to the attention of the authors have been swiftly implemented, which makes me hopeful that the very few glitches noted will similarly be implemented. Kudos for supporting the book and not simply calling it quits after release! Editing and formatting are extremely impressive for a rules-book of this size in both formal and rules-language criteria. The tome adheres to a 2-column full-color layout that is rather professional, and I noticed some of my favorite, old D&D- and stock-artworks herein. The pdf comes fully bookmarked for your convenience, with detailed nested bookmarks that make using the file a pleasure; similarly, the index and ability to cut-copy-paste text from the book help rendering this really consumer-friendly. Kudos! Alex Clippinger, Scott Bean and Micah Watt, in the partnership between Dragon Rock Games and Pyromaniac Press, have created a massive and truly impressive tome. From Talona’s poison smite spell to Sune’s chivalrous paladins, this book is chock-full with Realms-lore and rules that make this a must-own tome for fans of Ed Greenwood’s legendary setting. If you’re playing in the Forgotten Realms, then you will want this book, simple as that. It offers an amazing bang-for-buck-ratio and tugs at the heart’s strings of anyone who ever played for an extended period of time in the Forgotten Realms. In a way, this could be considered to be a kind of homecoming for paladins and clerics; and while I bemoan the lack of support for all classes (hey, you can be a believer sans being a cleric/pala, right? ), considering the size of this tome, the complaint feels petty. The one thing that I honestly felt was lacking from this book, is the courage to tweak the design of the respective class options to make the worshipers of deities feel more distinct. For example, having Undine’s power alternate like ebb and flow, forcing alternating between channel options or effects; have Shar/Mystra, for example, sport some unique casting tricks – you get the idea. The experience of the systems the class options provide, are rather conservative and don’t provide a truly creative or distinct tweak on the system, where e.g. Deneir etc. would have very well warranted such an inclusion. This book, design-wise, plays it safe – but it does so remarkably well. When all’s said and done, this means that I consider this to be an excellent tome, albeit a very focused and conservative one – my final verdict will hence clock in at 4.5 stars, rounded up for the purpose of this platform. I’m excited to see more come out of this obviously fruitful collaboration. You can get this massive tome here on DM’s Guild!